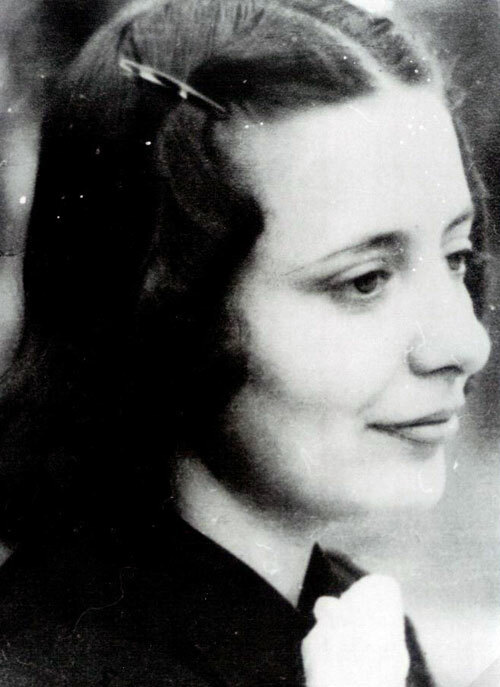 Writer and political figure, Musine Kokalari (1917-1983) was the first female writer and political activist in Albania. Born in Adana in southern Turkey to a family of Gjirokastra origin, Kokalari acquired a taste for books and learning early in life because her brother Vejsim operated a bookshop in Tirana in the mid-1930s. In January 1938, after attending the Queen Mother Institute in Tirana, she got a scholarship to study literature in Rome and graduated from university there in 1941. Life in the eternal city gave her an ephemeral glimpse into a fascinating world of intellectual creativity, and her sole aim in life upon her return to Albania was to become a writer. Indeed, in the years 1941-1944, she published three volumes of prose, a unique achievement for an Albanian woman at the time. Equally unusual was her political role during the Second World War in attempts to found an Albanian Social Democratic Party. As the war came to an end, Kokalari was running the family bookstore and was invited to become a member of the Albanian Writers’ Union, created on 7 October 1945 under the chairmanship of Sejfulla Malëshova. All this time, she was haunted by the murder of her two brothers, Mumtaz and Vejsim, on 12 November 1944 by Communist partisans and candidly demanded justice and retribution. 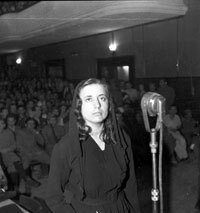 Having herself been closely associated in 1943 with the founding of the fledgling Albanian Social Democratic Party and its press medium “Zëri i lirisë” (The Voice of Freedom), she was arrested on 17 January 1946 in an age of terror concomitant with the fall of Malëshova, and on 2 July 1946 she was sentenced by the military court of Tirana to twenty years in prison as a ‘saboteur and enemy of the people.’ The next fifteen years of her life were spent in the infamous prison of Burrel in the Mat region, isolated and under constant surveillance, persecuted and provoked by boorish and uneducated prison officers. A broken woman, she was released in October 1961 and given a job as a street sweeper in the provincial town of Rrëshen. Musine Kokalari, once a gifted young teller of tales and rising political figure, was persecuted to the end of her days. Terminally ill with cancer, she was denied proper treatment until her death in 1983. In this text, recorded secretly in 1972, Musine Kokalari tells of her life and her attempts to found a Social Democratic Party. 1. A primary objective of the Social Democratic Party is to ensure social justice and political freedom. 2. The Social Democratic Party takes an evolutionist stance as regards economic collectivism. 3. Other primary objectives of the Social Democratic Party are to ensure enough land for the farmers to work on, and to eliminate exploitation, speculation and parasitism. It also aims at providing food, housing and other needs for the working class to make their lives liveable. Agrarian reform – initial steps will be taken to divide up the land. The Party will endeavour to implement a social security scheme to afford protection to all classes of society. 4. Political freedom means ensuring the right of every citizen to freedom of speech, freedom of thought, freedom of the press, freedom of private initiative and freedom to vote (parliamentary opposition). The Party will endeavour to lay foundations to contribute to the education of all classes of Albanian society democratically and to prepare them for the coming regime under which social justice and political freedom will reign. The main reason for restrictions on political freedoms is [the lack of] social justice. 5. With regard to relations with other nations, the Party will not be led by narrow egotistical nationalism, but by simple patriotism that concords with feelings of respect and affection for other nations, and it will support the idea of creating a Balkan confederation as soon as possible. 6. Another objective of the Party is to fight against all occupiers for the independence of a united Albania within its own ethnic borders. The ideals of the Rilindja period were still very much alive. Democrats looked towards them and found their calling in them, i.e. the ideals of evolution and progress. People became aware of the possibility of gradual development. However, parallel to these ideas, the October Revolution introduced into Albania other revolutionary ideas, and Communist groups sprang up here and there, though not everywhere in the country, who adhered to principles that were unclear and not uniform. The nationalist element was represented, more or less, by Balli Kombëtar, a heterogeneous organisation with no specific organisational form but with a broad democratic platform that interpreted the future of the country as a parliamentary democracy rather than under the Communists. This collection of people with various political tendencies regarded themselves as simple patriots, without any further qualification, even reformist or the like. I remember talking to him once in his bookshop before he went underground. He complained that Yugoslav agents had entered Albania and were taking hold of the country from within. “But that is the main issue today,” he replied. “Whether we take up the fight or wait tactically so as not to be harmed is a question of patriotism. The Communists, for their part, are using patriotism and promising that they will take power when Albania is liberated, and I am afraid that they will keep this promise,” he added. In my opinion, the issue was not so much one of getting Balli Kombëtar and the National Liberation Front together, but one of creating a basic democratic alliance. I talked about this when I met Nexhmije Xhuglini (later known as Nexhmije Hoxha) and we discussed how to intensify the struggle against the occupiers. I suggested that we could join the National Liberation Front not as individuals, but as a democratic group or, better still, as a party (the Social Democrats represented the middle road that could attract undecided forces and with them, we could join in an alliance with the Communist Party as part of the National Liberation Front). She did not agree, stating that it was no time for creating other parties, but rather for fighting the occupiers. We held our meetings at the house of the schoolteacher Razie Hallulli who took part, as did Mefarete Frashëri, Afërdita Asllani and Gjokoroce. The first three of them supported me, whereas the latter said nothing. At that time, we were working together on bringing out the first issue of a magazine called Gruaja Shqiptare [The Albanian Woman]. I had written the introduction and prepared a short story for it called Hieja e djalit [The Son’s Shadow], but Nexhmije continued to make trouble. She wanted to be the one to give all the orders which we were simply to carry out, and do nothing else. This climate was what eventually caused me to leave the National Liberation Front after I had tried to have us join as a group and then create a Social Democratic Party within it, so that we could take part in the fight against the occupiers. At that time, I happened to come across the lawyer Skënder Muço whom I had encountered at the prison gate in 1932. I also became acquainted with the literature professor Isuf Luzaj and the talented linguist Selman Riza. They were all worried about the direction the war was taking, in particular in the Vlora region where the armed groups had begun arguing with one another and, according to what they told me, the Communists had been attacking them and trying to disperse them. Though they all respected Lumo Skëndo, they deplored the sluggishness of his leadership and wanted better organisation and unity. In the Vlora region, the authority of Hysni Lepenica, to whom they submitted, consisted of trying to find a balance between the disagreeing parties or rather between their ambitious leaders. They greatly respected him, as he was known to be modest and patriotic. He was shot and killed in Grehot by the Italians. With these men, I once again brought up the idea of a democratic coalition. I proposed that, while relying on the Ten-Point Programme, we should form a Social Democratic Party. They agreed and, after much debate, Isuf Luzaj and I drafted the party programme. We then chose Skënder to take things from there. I went to have a talk with Mid’hat Bey, but he was not there, so I spoke to Hasan Dosti, who was his deputy. Dosti was a well-educated, modest and quiet man who did not show any particular initiative in the matter himself, but simply said that he agreed with whatever Mid’hat Bey said, and added nothing else. I brought up the subject of the foundation of a Social Democratic Party. He replied that Mid’hat Bey did not like the idea and did not approve of it. I countered that we did not need his approval because the Ten-Point Programme already foresaw the possibility. We then published a brochure announcing the creation of the party. Only one meeting was held, which was organized by Skënder Muço. We gathered at a house on the Elbasan Road. Unfortunately, I do not remember the name of the owner, who was a member of the Front. About sixty people attended. Aside from the house owner, there was Qiriako Harito, a member of the Front and very active in it. Skënder gave the opening speech. He reviewed the situation, spoke about the in-fighting that had taken place in the Vlora region, about the necessity of unity among the people, about endeavours to reach an agreement with the Front for a more intensive struggle, and about the creation of a Social Democratic Party (the four of us were in the initial group). When he was finished, I was asked to read out the programme. It was a rather delicate moment. The house owner spoke out: “We are members of the Front, we are working, sacrificing our lives. You are simply using us as a facade.” He was truly angry at the idea. Skënder Muço stood up hastily and turned to the two of them. “Well, are you going to join us in the Social Democratic Party, too?” Qiriako Harito was in a rather awkward position and grasped for words. The other fellow babbled, going on and on and finding no end. None of the remaining men said anything. So I got up and turned to Skënder. “This is the first time we have gotten together. Those of us who issued the communiqué must continue with our main task, which is organization. We must carry on with the armed struggle, give proof of our action, and then these people you are addressing here can decide for themselves on what they want to do.” I was not for dissension or for weakening the National Liberation Front. What was important was that we continue on a path of unity, remain together and, if necessary, struggle for recognition in the Front of our membership as a Social Democratic Party. Qiriako Harito gathered his wits, as did the other fellow. They agreed with what I had said and added that we should try to achieve our objectives as quickly as possible. They insisted they would always be supportive of the armed struggle, of unity and democracy. Nexhat and the others thought that our group had been created by other figures whom they did not know. They actually suspected that the Communists were behind us or that we would be forced or convinced to side with the Communists. Nonetheless, Nexhat saw himself compelled to publish and distribute the issue of Zëri i lirisë. Skënder was then made editor of the newspaper under Balli. I gathered material for it wherever I could. Isuf Luzaj helped me, too, and I was able to get six issues out. No one knew who we were, how many of us there were and who was behind the newspaper. I was the actual driving force. But did I believe in its success? No. The four of us who founded it never met again. I published the six issues with one aim: to make known our platform, our party programme. If Albania were to become a democratic country after liberation, we could use this platform as a basis for progress and advancement. What happened during the period of German occupation? The Mukaj Agreement was welcomed by everyone. There was unity initially, and everyone was disappointed when this unity collapsed. The Communists spread rumours that the Balli people did not want to fight the occupiers. But a courier was caught who had with him a decision of the Central Committee of the Communist Party that condemned the position and decision of Ymer Dishnica and his companions. Instructions had been issued to promote and write about strengthening ties with the Soviet Union and other such matters. These things appeared in the press and it became apparent that the Front, or rather the Communists, were the ones who destroyed the Mukaj Agreement. It was not because the Balli men refused to fight. It was a moment I remember because the Communists were endeavouring to take over power. At that time, many people were abandoning the Front. The departure of Xhelal Staravecka did much damage in particular. He knew the Communists and where their units were based. A lot of people were killed. One group of young men went to Berat and German forces were all the more savage. Skënder Muço was killed in Vlora while he was meeting the English. Balli was paralyzed. It held a congress in Berat and some of its leaders, such as Kolë Tromara, Bahri Omari and Koço Muka, agreed to take part in the government. I stopped publishing the newspaper and devoted myself to creative writing. Any further efforts were a waste of time, on both sides. The fourth of February was a deep shock. Another massacre occurred on February 27th, though fewer people were killed. The attack on Dibra Street made quite an impression. An attempt to assassinate Mustafa Kruja failed, as did one against Xhafer Deva. It was said that Iljaz Agushi was killed by Bujar Hoxha, the son of a friend of his. Bujar simply went over to his house and shot him. Lefter Kosova, minister of education, was murdered by Xhelal Staravecka right in front of his house, I believe after the government of Rexhep Mitrovica was formed. Then about one hundred or so men left for Prishtina. The streets of Tirana looked like they were under siege. Beqir Valteri was escorted by ten men to his left and right and at least ten others behind him who follow his thundering footsteps. The sidewalks were not wide enough to encompass his majesty. This would-be assassin of King Zog, as was said, had set up the flag of the United States in a room in Hotel Dajti because he was going to create a Balkan Confederation. 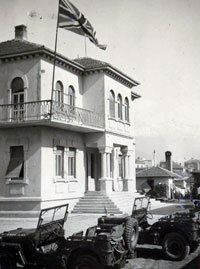 Preng Previzi murdered Selman Çela in plain daylight on the square right in front of the ministries. They also killed an officer on that square who had apparently raped a prisoner. Seit Matia and four other armed men loitered the streets of Tirana on the lookout for Communists. They also got the bodyguard of Bazi i Canës who had just come back from the front. Mehdi Bey returned from Italy and was appointed head of the Regency Council. Gjon Markagjoni was prowling about in Tirana, as was Gjon Fusha. Osman Gazepi who had given himself a lofty rank, strolled through the streets with a girl in one arm and his niece in the other. Behind him were his bodyguards. Mehmet Alemi pillaged houses. Muharrem Bajraktari and Ali Alija came and went as they pleased. Man Kokoleshi remained very powerful, as was Papalilo. Cen Elezi had one foot in town and one in the mountains. His ten lads were under his tight control. Idriz Jazo put the fear of God into Gjirokastra. Bule Naipi and Persefoni Kokëdhima were hanged. Ali Peçi became famous for his deeds of daring do. The Resilia clan ruled Vlora and departed for camps in Germany. Isa Manastërliu exercised power in Lushnja. Hamit Matjani and his two wives held sway in Peqin. Azis Biçaku terrorized Elbasan, and Hasan Isufi terrorized Shkodra. Xhem Gostivari ruled over lower Tropoja. In Dibra, Ukë Cami and his men were under the leadership of Fiqri Dine. The murders that Isa Toska committed during the Italian occupation were covered up. The suicide of poor Safet Butka in the Korça region was a great tragedy in that unbearable period. All of Albania was now occupied by the Germans. People knew that Mehdi Frashëri sent his second son to Turkey to seek an agreement while the Regency held sway in the country, headed by Mehdi Bey, Pater Anton Harapi, Fuat Bey who was lucky and died, Lef Nosi who replaced him, and some fellow from Shkodra whose name I can’t recall. Albania under German occupation was actually under their rule. They all endeavoured to expend their personal fiefdoms, primarily with the support of paid mercenaries recruited in areas under their control. Initially, they had the support of the Italians and then, all the more, of the Germans. They were personally responsible for crimes and dissension. It was a bloody and tragic situation where the past and the future clashed in a background of chaos, murder and imprisonment. The fourth of February filled Tirana with corpses. It was a confusing mess for all of those who dreamed of a just peace and a democratic Albania. Fighting began in Tirana. On 12 November, my two brothers and some other men were seized in the neighbourhood (fortunately my third brother was down with typhoid fever) and murdered by ‘liberation soldiers’. On 13 November they arrested me, too. They held me for a time in a house in our neighbourhood. At daybreak they then dragged us off to the other side of Fortuz Street in the sight of a German tank. They took us to Bardhyl Street and cast us into the cellar of a house containing many prisoners. They were from all over. “Did you cause dissension in our ranks?” they asked. “Who said so? Where is your proof?” I replied. “You did not fight,” they said. “You people did not give us an opportunity to fight,” I countered. “A book?” replied the ignorant Sulo Kozeli. They sent me back to my cell. We were taken to Dibra Street, where they released me, but then arrested me again. This time I was visited by Beqir Balluku. On 28 November 1944, I was released once more. My two innocent brothers had been murdered. I was at home during the final liberation of the country but I was afraid for my life. Thus began the tragedy of a democratic living under the dictatorship of the proletariat. It marked the end of the Rilindja period and of democratic endeavours by humane individuals who wanted to defend the poor, to protect the workers in order to save them from physical and intellectual slavery, to protect their human dignity. An age of violence and bloodshed had begun that would destroy the very concept of democracy; it was a time of lust for blood. The new concept of the dictatorship of the proletariat, although it was initially not implemented thoroughly, contrasted in the war period and thereafter with the concept of progressive, illuminist democracy. It was an opportunistic position taken by many during the anti-fascist struggle. The democratic camp, represented by Balli Kombëtar, had been shaken, whereas the Communist Party that ran the National Liberation Front concentrated on an uninterrupted and uncompromised struggle with the occupiers. Those democrats who submitted, joined the war effort and lost their political importance, and those who dared to stand up for political pluralism soon faced the bullet or ended up in prison. Those who remained with Balli played no significant role in the war anymore. Albania had already entered the post-war phase in which the forces of East and West were endeavouring to maintain their positions and domestic groups had no choice but to decide on their allegiance to Western or to Eastern democracy. People began to examine what communism actually was and wondered secretly (as would come out later) what direction the Communist Party and those who led the resistance would take, to what extent they would agree with one another, and with their Soviet comrades. In other words, how scientific Marxism, oblivious to the principle of equality, would work out in a little country among those who were striving for power. November 1945 approached. There was talk of elections. Decisions were made and the country’s direction was set forth. 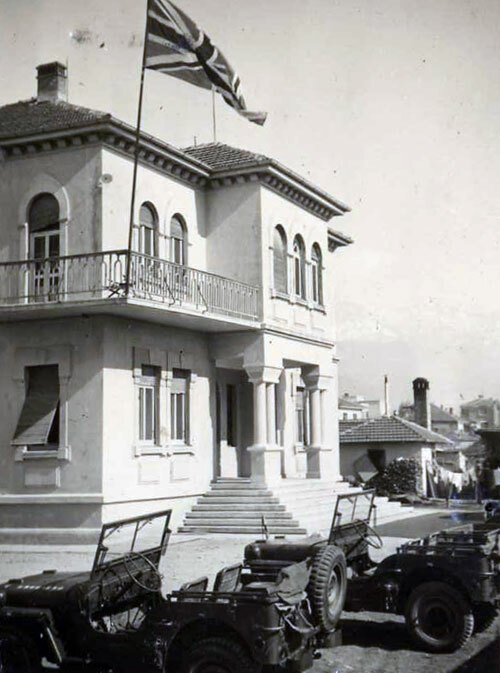 The British, American, French, Yugoslav and Soviet missions were still active in Albania. The new government sought recognition. The Western allies told them first to hold democratic elections. The representatives of UNRRA were also present and the situation was very complicated. Those who had been in the Front, but had not been Communist, sided with the West. We democrats were hoping for a Democratic Republic. But would we ever achieve it? Could it be achieved by peaceful means? At this time, Shaban Balla came around to see me at my bookshop. I did not know him. He told me his name and spoke candidly and without hesitation, saying that the time had come for us to do something, to support the English. I had no particular plan and certainly no intention of discussing the subject with someone I did not know. He realised that I was keeping silent out of mistrust. I refused. I did not take the package, nor did I show any interest in it. As I was on the ‘waiting list’ for re-imprisonment, I did not want to be involved in other peoples’ business. It was well known what kinds of torture were going on. Communist propaganda had described them well enough. Shaban came around a second time. On this occasion he began discussing the issue of elections. I listened with interest to what he had to say. I had never been one to get involved in underground movements or to choose them to reach my objectives. I did not understand, and had no confidence as to whether people were telling me the truth about who they were. I was more one to express my views candidly and demand my rights without hesitation. What I did agree with was to seek moral support from the Allies, to ask the government to put off the elections and let other parties take part in them. If all of this could be made possible, the situation would be alright. If this could not be achieved and they imprisoned me for trying, at least I would know why I was in prison. I would have a good conscience because I was seeking something legitimate, above the board, even though the Communists opposed it. Sami Çaribashi came by. He wanted us to unite in a solid block. I replied that I would only get involved in requests, for instance for the government to postpone the elections, and wanted us to work openly in line with the principles we cherished. Then Suat [Asllani] came around and said: “We must try and elect some deputies, to get into the People’s Assembly and form an opposition.” I refused to get involved in any secret doings. Shaban Balla came by again with a letter written by the officer Lykke, as far as I remember, saying that we should get Gjergj Kokoshi to work with us in the opposition as he was a member of the Front and chosen by the Communists. I told Shaban that I did not agree. I said we should chose our own people and strategies. They wanted him as an intermediary with the government to get the elections postponed and to ensure a democratic vote. Xhemal Ferko, a one-time student of Sotir Kolesa, arrived from Syria. He had spoken on the radio in Egypt and was then in Bari. As a secondary school student, he used the pseudonym Sula i Fajës. He told me, as far as I understood him, that the English were to being fair with Albania. At the Mediterranean headquarters he had met Miss Hasluck who had lived in Albania. She had worked and written a lot, but was not well disposed towards our country. They simply wanted to stir things up, but not because they cared about us. Marash Ivanaj also came back to Albania at that time. He was a teacher and had been minister of education. In 1933, he had closed down all the private schools in Albania. He left the country with his brother during the occupation and settled in Turkey. He told a friend of mine: “The English do not have honest intentions here. I know what life is like abroad. My brother died there because I did not have enough money for his operation.” He had returned to this country to work as he had before and not to hope for miracles from the English and the Americans. We had little hope, yet something had to be done. I stuck by what I had said and did not endeavour to find out what other groups were up to. I kept my distance from other people and groups, and only expressed my idea about the Note when I was asked. “Do you agree,” I asked. “Yes,” they all replied enthusiastically. “Rightly so,” they all replied. I took a pen and formulated the Note. The four Zogists, the four resistance men, Musa Dizdari, a friend of mine of Social Democratic orientation, and I all signed the document. Because I had insisted that we keep things to ourselves and not get other people involved, I added, in my handwriting, the names of two democratic companions of mine, thinking that if things went as planned, they would not be against this. If things turned out badly, they would not suffer, and indeed they did not, because I later stated during interrogation that they had had no idea about the democratic coalition. Shaban Balla transmitted a copy of the document to the English and another copy to the Americans. I spoke to the officer Palmer on one occasion only to seek his support for this undertaking if they wanted the elections to be democratic, as they claimed. However, the Allies did not intervene with the government at all. They kept silent. This would have been a real occasion for them to demonstrate that they wanted multiparty elections. And yet, they did nothing. Why? Possibly because they did not want us to be arrested as they would have revealed our names. Their reaction was a mistake at any rate. One by one, we were all arrested and there was no one left to support the idea of postponing the elections so that we participate in them. We were now accused of something far more sinister: a conspiracy to overthrow the government. Had they been completely frank, the English and the Americans would have had no problem in making it known that the democratic parties were not being allowed to take part in the elections. They had a document as proof of our existence, and the elections were not democratic because other parties did not take part. They lost the public debate and, with their silence, caused us to be accused of a grave crime. I do not want to say that we were their victims because it was my own decision to make a third attempt to form a Social Democratic Party. They lost out because the others worked hard towards their ideals in an organised manner; they had fought and sacrificed. Their moral superiority was unquestionable and well-deserved, and our fall was equally well deserved. A lot of good people who came after us lost their lives for nothing. I was arrested on 23 January 1946, right after the Zogists and resistance groups who were detained on 10 January. The investigator brought up the issue of the Note. Nesti Kerenxhi, Siri Çarçani, Edip Çuçi, and Kadri Hazbiu were involved in the accusations made against me. I had no difficulty in defending myself and they struggled greatly to maintain their accusation of me attempting to overthrow the government. The interrogation began. I was asked about the Note. They had already spoken to other people before me, but the latter had not been sufficiently clear to defend themselves. They gave no reaction, unsure of what they should say. “You attempted to overthrow the government,” they declared. “You were making use of the ruling class, taking advantage of their forces to take over the leadership,” they countered. “We were the ones who were doing the fighting,” they said. “Did you want to have your own publishing facilities?” they asked. I defended my position, in writing, too. The state prosecutor, Gjon Banushi, and the judge, Frederik Nosi, repeated their accusations at the trial held at the high court, and I defended my ideas right to the last. “Is this true?” they asked. “But there were four persons in each group, so why did you do all the work alone?” asked the judge. “Enough with your sophisms!” shouted Frederik Nosi. “There is no sense in your asking me then. Read the trial documents,” I stated, satisfied with myself, and sat down at my place. The closing arguments were severe. Whatever was discussed, it always came back to me. I thought that they were going to sentence me to death. In addition, the prosecutor accused me of the sins of the rest of them. I made no comment. The judge and the prosecutor both rose to their feet and interrupted me. “If you stop me and will not allow a prisoner to defend herself, I will sit down because I have no other choice,” I said. I went back to my seat. Shortly thereafter, the officer Manoli came over and confiscated my defence. I gave it to him. 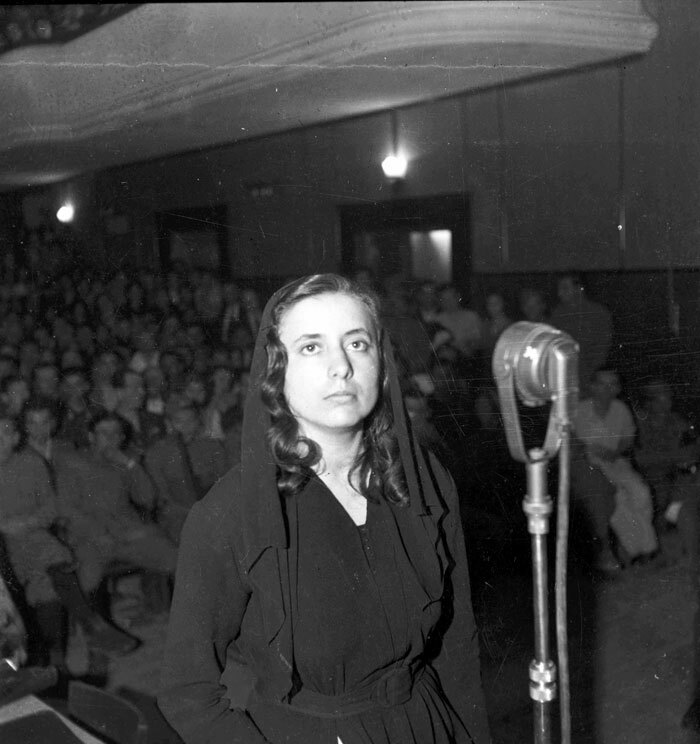 Musine Kokalari on trial in 1946. They asked me for a concluding word. I asked for justice. The trial lasted for 15 days. In the end, the judge sentenced me to twenty years and I was incarcerated. There were few women in the prison, mostly petty criminals. Regulations began to be enforced with my arrival. Visits were no longer allowed at the gate. You could only talk through a little window in the gate itself. Many people came to try and visit me, but they would only let my family members talk to me. Three months later, I was put into isolation in a cell under the staircase leading to the director’s office. One of the prisoners, whom I could see through my little window onto the prison courtyard, told me that they were interrogating Xhemal Farka about me. I understood. He said nothing about me and I said nothing about him. I was kept in isolation day and night in the dark for a year. In the toilet, I came across a newspaper and learned that our country had broken relations with Yugoslavia. The eighth Plenary Session had been held and I had been called to give a short presentation of the Social Democratic platform. I was released from prison on 8 October 1961. On our way to Rrëshen, we changed vehicles four times, always accompanied by the same two policemen. […] My mother came to live with me there, but we were very isolated from everyone else. They would say no more than ‘hello’ to us, and that was it.